Devil’s Delight is a five reel and three row slots game with a choice of one to 20 paylines and a theoretical return to player percentage of 97.6%, which is simply jam-packed with extra features. Those features include free spins, scatter wins, a ‘Soul Reaper’ bonus game and plenty more besides. A game that epitomises the phrase ‘naughty but nice’, Devil’s Delight is a slots game themed around the underworld and include loads of special features and elements. What you will find below is a brief guide to the game which will look at its top jackpot, special symbols and games, paytable and betting limits. The Devil’s Delight slot game, like most five reel slots, pays out its highest jackpots on paylines which feature five identical symbols consecutively from left to right. In this particular game, the most valuable combination pays an amount equal to 4000 times the player’s bet level. What that means is that at the highest bet level of ten, the payout can equal 40,000 coins. With a potential maximum coin value of 50p, the currency value of that jackpot can be as high as a tasty £20,000. Theoretically too, a player could rack up that particular combination across all 20 paylines if they are playing them all and in that circumstance a total payout of £400,000 could result. Alternatively, they could also achieve the combination with the maximum free spins multiplier of five time in place and therefore win 200,000 coins. As well as having a wickedly entertaining theme and a potentially huge top jackpot, Devil’s Delight also features a number of special symbols with interesting functions. These are namely the wild symbol, the scatter symbol and the bonus symbol. Wild Symbol – the wild symbol is represented by a suited devil with a cigar, substitutes for any other symbol apart from the bonus or scatter symbol and can appear anywhere on reels 1-4. The wild will always work to create the highest possible winning combination and if it appears on reel 2, 3 or 4 it expands to cover the entire reel when completing winning paylines. 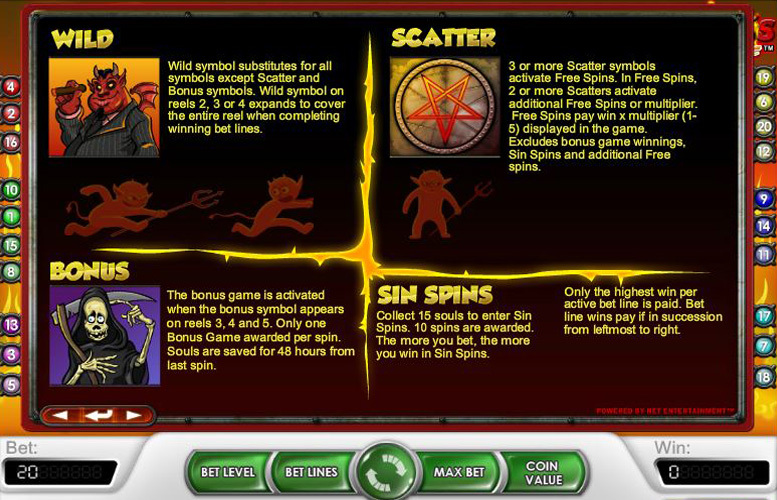 Scatter – Devil’s Delight’s scatter symbols take the form of pentagrams and if three or more of them appear anywhere, they activate the game’s free spins. 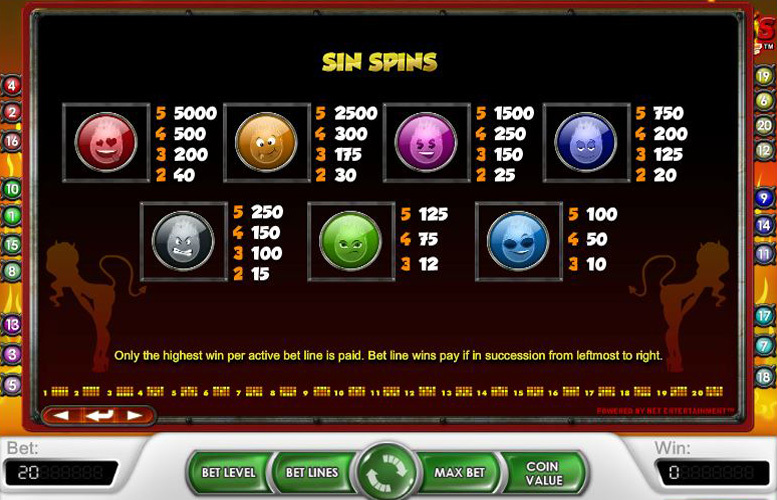 Free spins are played at the same bet level, bet lines and coin values of the spin that activates them and the number of free spins awarded each time is random. The free spins also pay winnings multiplied by a different multiplier up to a maximum of five, and the multiplier for any set of free spins is also randomly decided. Two or more scatter symbols during free spins activate additional free spins on top of those already earned. 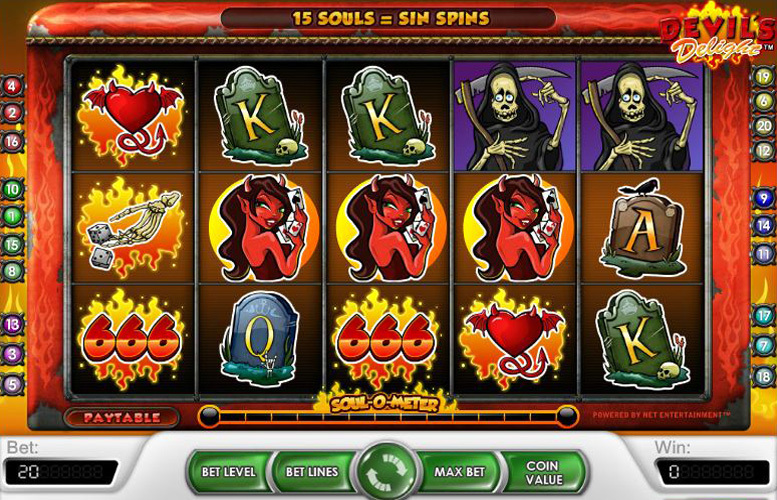 Bonus Symbol – Depicted by a grim reaper, the Devil’s Delight bonus symbol triggers a ‘Soul Reaper’ bonus game if it appears at any time on reel 3, 4 AND 5. During that game a player must match a character to the correct sin and if they do so, they receive a coin win and have a soul added to their ‘Soul-O-Meter’. Souls in the ‘Soul-O-Meter’ are retained for 48 hours and if 15 souls are collected then the game’s ‘Sin Spin’ feature is activated. That feature is another different way for players to receive big coin wins and each time it is triggered ‘Sin Spins’ provides ten spins. Wins in the feature are based on an average of the bets used to win the souls and the average is equal to the coin value multiplied by the bet level used when collecting souls. 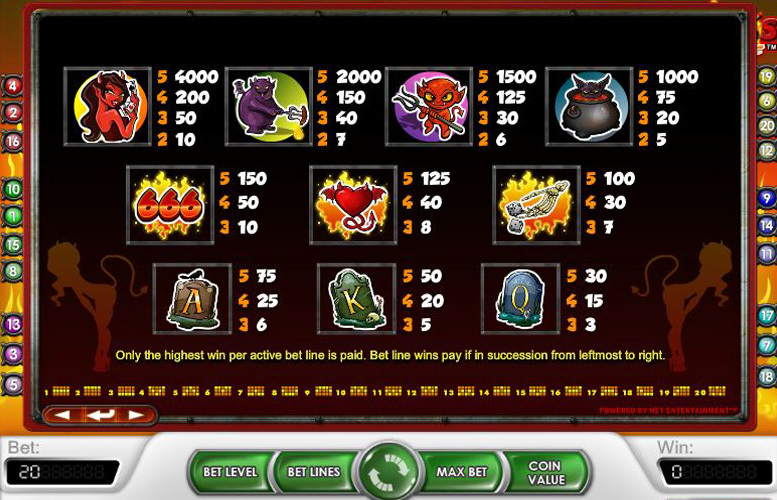 There are clearly many ways to win through Devil’s Delight but the main method is by lining up five consecutive symbols from left to right across one of the game’s active paylines. The most valuable such combination is if you achieve five of the female devil symbols and that combination pays out at a level of 4000 times the bet level. That means that at the highest bet level of ten and with the highest coin value of 50p, the combination returns a win of 40,000 coins which would be worth a total of £20,000. If that combination occurs during a free spin when the maximum five times multiplier is present too, the payout becomes an even more lofty 200,000 coins worth £100,000. The next most valuable combination in the game is five of the purple devil symbols and that combo pays out at 2000 times the current bet level. Devil’s Delight is a slot game which gives players a great deal of control over the amount they bet per spin. Players can choose to play anywhere between one to 20 paylines, at ten separate bet levels from 1-10 and with six different coin values from 1p to 50p. What all of that means is that a player can choose to set all of those three categories at their lowest (one payline, bet level one and a coin value of 1p) and therefore bet just 1p per spin. Alternatively however, they could set them all at their highest (20 paylines, bet level ten and a coin value of 50p) and bet the maximum of £100 per spin. Devil’s Delight arguably has everything any potential player could want from a slots game, in that it combines loads of extra features and games with an attractive theme and the chance to win huge jackpots. Players who want their game to offer loads of entertainment and engaging gameplay will love the ‘Soul Reaper’ bonus game and the ‘Sin Spins’ feature which must be worked towards to activate. Fans of big jackpots meanwhile, will be impressed by the potential top jackpot of 200,000 coins which can equate to as much as £100,000 at the highest bet level and coin value settings. To complete an excellent package, Devil’s Delight also offers extensive control of betting amounts by allowing players to set the number of active paylines, as well as their bet level and coin value preferences. All in all then, this hell themed slot is arguably as heavenly as such a game could possibly be. This game has a rating of 5 / 5 with 355 total reviews by the users.